Brendan Rodgers' side went into the game with three points from three Group B games, including a 2-0 defeat to the German outfit at the Red Bull Arena last month, but Kieran Tierney's early strike gave them a deserved interval lead. The visitors levelled in the 78th minute through striker Jean-Kevin Augustin but only a minute later French forward Edouard, playing his 50th game in green and white, restored the Hoops' lead. 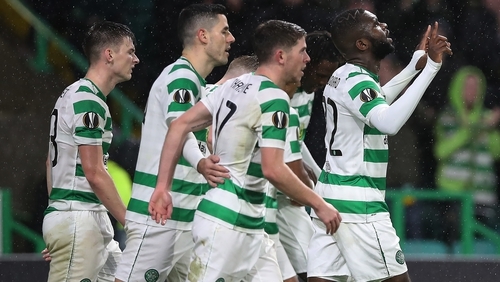 Edouard's winner took the Scottish champions on to six points, the same as Ralf Rangnick's side, who have a better goal difference and head-to-head. Midfielder Callum McGregor's quick free-kick to James Forrest set the Scotland winger free down the right and his pass sped across the penalty area untouched until it reached Tierney. Bruma's deflected strike caused Gordon little trouble but moments later Sinclair raced on to an Edouard flick and into the box but took too long to get his shot away and was crowded out, before Edouard's drive from 12 yards was stopped by Mvogo. A swift Celtic attack moments later ended with Edouard's deflected drive from a tight angle speeding across the goal.